Brie Larson has given fans a sneak peek at Captain Marvel ahead of the upcoming film, with one very specific purpose – she wants you to vote in the midterm elections. Turns out superheroes are just as interested in democracy as they are in saving the galaxy. Who knew? The image shows Captain Marvel hanging out in a phone booth surrounded by posters reading: ‘Rock The Vote’. We can’t be 100% sure, but we think she might want people to vote. The mid-term elections are taking place today in the US, with many celebrities urging their fans to vote on social media. The 2019 film is set to be Marvel’s first female-led superhero film (about time! ), focusing on Captain Marvel – real name Carol Danvers – a former US Air Force army pilot, as she joins Starforce, an elite Kree military team. 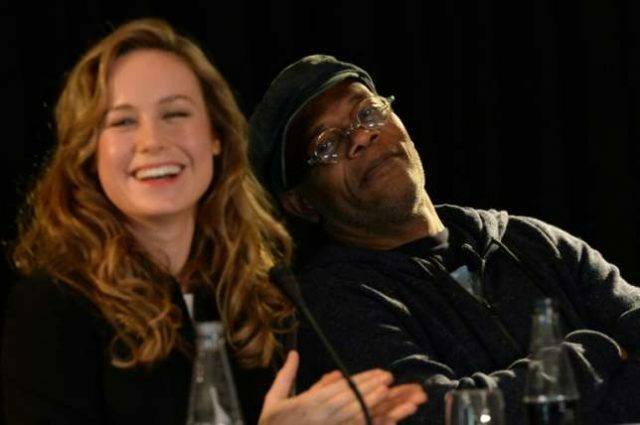 Brie will star alongside Marvel fan fave Samuel L. Jackson (Nick Fury), as well as Jude Law (rumoured to play Mar-Vell), and Gemma Chan (Doctor Minerva), who are new additions to the Marvel Cinematic Universe. Marvel bosses recently assured fans that the superhero flick will be ‘very different’ to any other origin story. ‘It takes place in the 1990s and while it is an origin story of our hero, it is a very different type of origin story which we’re excited to unveil to audiences,’ producer Kevin Feige told Variety.